Wilshire Boulevard has been called the first great avenue of the Automobile Age and one of the most magnificent thoroughfares on the planet. Early boosters crowned Wilshire the Fifth Avenue of the West and the Champs-Elysee of the Pacific. In the city that long ago submitted its soul to the allures and double-crosses of the motor car, Wilshire serves as the great iconic L.A. drive. While Sunset Boulevard and Mulholland Drive wow with beauty and breath-taking views, Wilshire is the undisputed Main Street of Los Angeles. 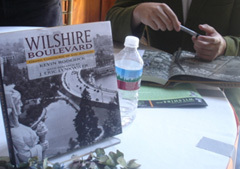 The boulevard is a 15.8-mile museum of twentieth-century Los Angeles that connects the office towers of Downtown to the beach at Santa Monica, and along the way reveals the story of a city growing up. An engaging narrative that examines the origins, lore and cultural standing of the nation's largest and most famous suburban enclave. "Just a superb book—this is history the way I like it," raved Kevin Starr, the noted historian and California State Librarian Emeritus. "Roderick is a good reporter and writer, and the book is full of interesting yarns that are well-told," said the Los Angeles Times Book Review. After the first edition sold out, a second edition updated the unprecedented election to consider whether the San Fernando Valley should separate from Los Angeles. Excerpts and photographs are available for viewing at America's Suburb.com.